At the Dia de los Muertos cooking class the chef topped the dessert with edible gold leaf and a lump rose in my throat. I thought of you, Marisela, the sister who arrived early and left too soon. Were you here, this is a dessert we could all share — you, me, and the brother and sister who stayed. Imagine: Slip the spoon past the cool depths of the vanilla ice cream into the silky texture of the creme caramel, cut in half the golden gelatin cubes, one for you and one for me, one for each of them. Who among your living siblings would you have favored? Would your nose have the indigenous slope that marks our heritage and your hair the straight thickness of your sisters’ crowns? Would your skin contain the chocolate hues of the twin brother with whom you swam our mother’s waters? Decades later, I think he still misses you, the girl with whom he tumbled in the womb. Impossible not to, I suppose, given the skin-to-skin quarters you shared and the inescapable rhythm of one another’s rushing hearts. Who knew it wouldn’t last? Today, our strength would be greater for our numbers — four! — an added pair of hands bound by history. Because we would have laughed and we would have fought. We would have whispered in the dark long after we were supposed to be asleep. I would have recorded you reading storybooks as I did our other siblings. As the oldest among us, I most certainly would have bossed you around and for a while you might have hated me. We would have gone our separate ways but remained united by the umbilicus of our mother. Perhaps you, too, would have one day given birth. I can almost see you, a grown woman weighed down with a child in your arms and a toddler clinging to your hand. We would reach for your children: “Let us help you.” Funny how in this scenario I see a flash of skirt, the curve of your dark head, or your receding back, but your face eludes me. Maybe because it would be too painful to see my own features in the symmetry of your face. Our family is not among those who tenderly remove the brown bones of ancestors from their resting place on the Day of the Dead. We never honored our antepasados with food or sugar calaveras or marigolds. That has never been our way. Instead we visited cemeteries, placed flowers on graves, and remembered. Today, I yearn for the solace of a more elaborate ritual, a sensual observation of color and food and song to commemorate those who’ve gone before and who certainly welcomed you into greater bosom of family. Have you watched me living my small life, Marisela, seen me struggle to retain control over even those things that are inconsequential? As your soul cavorts among universes yet unknown to me, do you think, “Oh, sister, if you only knew! Let it go.” Can you, from your omniscient plane, access the innermost reaches of our mother’s brain? Does she think of you? Of me? I’m barely a decent cook whose greatest strength is that I can follow a recipe. 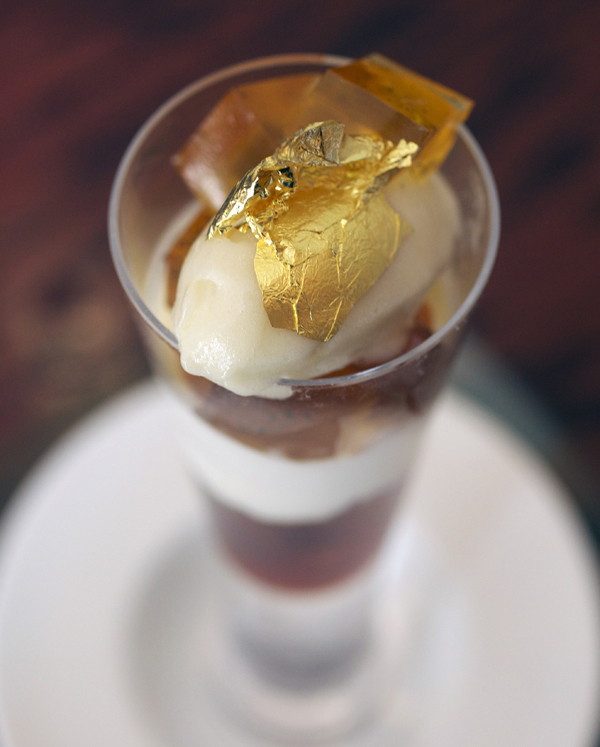 I won’t even pretend that one day I will make the creme caramel dessert topped with ice cream and gold leaf. The best I can do in terms of an offering is use the overripe fruit on the counter to fill the kitchen with the scent of banana bread. I think of you as I slice into the cooling loaf. But know this querida: If we’d ever had the fortune to share a dessert fit for royalty, I would have let you have the gold leaf.